As a GP working in an Aboriginal Service, I’ve often heard the terms “Mens Business” and “Women’s Business”. In my mind, that has loosely related to “Urological” and “Gynaecological” issues – until I actually asked about it, and discovered that it was oh so much more than that! In the process, I learned a whole lot more about the rich Aboriginal Culture, and how I can work more effectively to improve the health outcomes for the Aboriginal Men in the community where I work. In Aboriginal and Torres Strait Islander culture, certain practices are performed by men and women separately, and this can be referred to as Men’s and Women’s Business. These practices have strict regulations, and penalties for breaking these rules can be severe. The terms Men’s Business and Women’s Business also relate to ceremonial roles. In ceremonies concerned with acting out The Dreaming, men and women have different roles. These roles differ from language group to language group. Some ceremonies are combined, but, depending on the reason why the ceremony is being held, some are for men only, and others for women only. An example of a common modern situation is when courses and conferences are held: it is common to see Men’s and Women’s Business on the agenda. In this context the group will split by gender and discuss issues separately. From a medical point of view, Mens Business includes health outcomes for Aboriginal Men, and all that it encompasses. This is an important area to consider. Aboriginal Men bear a far greater burden of disease than their non-Aboriginal counterparts when you think of chronic disease, mental health, sexual health, substance abuse and injuries. In striving to provide accessible health care to Aboriginal Men, trust is paramount, and takes time to build. GPs are well placed to build trust over time. The Aboriginal health model is holistic, looking beyond the physical aspects of the presenting complaint to the social, emotional and cultural well-being of the whole Community in which each individual lives. Examining ways to make your services more holistic can impact health outcomes significantly. Many Aboriginal men have poor access to health services, and this can be addressed by discussing better access with the community itself – they are bound to come up with practical solutions. Many mainstream health services are not culturally appropriate: they do not feel like welcoming places for Aboriginal Men. You may consider asking the men in the community how you could make the clinic more culturally appropriate. It is our duty to make our clinics more accessible to Aboriginal men. Displaying more male specific health information posters targeting Elders, Young men and Children can be considered. Something as simple as ensuring that the place is comfortable and culturally appropriate will make it more accessible, and us more approachable. In many clinics, there are far more women than men workers, making it less welcoming to men. This may be something that can be addressed at a management level. There may be a community perception that privacy and confidentiality is not good enough at ACCHS – working hard to change these perceptions can have a positive outcome in health care access. Discussions with clinic staff to determine how the perception of privacy can be improved can be very effective. Arrange a focus group to get ideas from men in the community. Look for ways to allow control of programs by the men themselves. Where possible it is preferable for men to speak to men and for women to speak to women, especially in circumstances where you are not known by the person or community. If organising meetings with community members, discuss whether or not the topic of conversation is suitable for everyone or if the issue of Men’s and Women’s Business will apply. It may require another staff member to attend and run the alternative session. Consider ways to overcome shame and stigma associated with some conditions, for example, sexual health matters. ‘Shame’ (deeply felt feelings of being ashamed or embarrassed) for Aboriginal and Torres Strait Islander people may result from sharing private or personal information, cultural beliefs and from breaches of confidentiality. 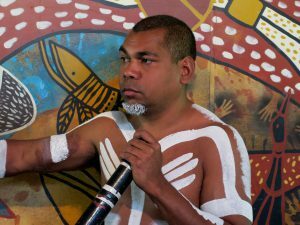 Andrology Australia has some very useful resources to address Men’s Health Issues in the Aboriginal and Torres Strait Islander communities, including a Clinical Summary Guide and a great eLearning course on ‘Engaging Aboriginal and Torres Strait Islander males in different primary health care settings’ . These are certainly well worth the read. Health is more than the medical issue: it’s about life in general, including family and community. Get to know the system you’re working in and who is available to assist with understanding the issues facing men in your community. Junior doctors need guidance when starting in a Aboriginal Service: don’t be shy to ask for advice from Aboriginal Health Workers. Men will feel comfortable in your clinic if they feel that the system is working and that there’s trust and respect between staff members and between staff and patients. There are so many more pearls from the Andrology site – you may consider taking a look at the Andrology Australia eLearning Modules for yourself. Resources in Aboriginal Health may be useful to review. Later this year, we’ll take a look at the “Women’s Business”, and the role we as GPs play in improving health outcomes for Aboriginal Women. For now, if you have any other tips to improve the health care to Aboriginal Men, please leave a comment below.